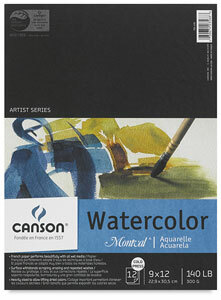 Canson Montval is a fine quality, acid-free, natural white, mildew resistant student watercolor paper. Prized for its texture and resistance to repeated washing, this Cold Press paper is suitable for all wet media techniques, including watercolor, gouache, wash, and acrylic painting. It is available in both a medium and a heavy grade. The 140 lb (300 gsm) grade has a hefty feel for a paper that can be purchased in a pad format, like that of expensive cotton papers. Pads are bound on the short side.